Moral relativism of the worst kind: ‘lecturing others on human rights, while trying to escape responsibility for our abuse of them’. It’s one of the great ironies of history that the last line of defence for the greatest empire the world has ever known proved to be the Patagonian Tooth fish. It’s an ugly and endangered denizen of the South Atlantic that the British government relied on, in vain as it turned out, to protect our imperial reputation. Faced with the prospect of being sued over atrocities said to have been committed in the last days of Empire, the Foreign Office turned to an obscure judgment over fishing licenses around the island of South Georgia, to try to prove that responsibility for the acts of colonial governments passed to the new government at independence, rather than staying with the former Imperial power. It was shameful and the judge rightly threw it out. So, three frail and elderly Kenyans appeared this week in the High Court, with Britain’s colonial reputation on trial. They claim to have been tortured – one says he was castrated – during the campaign against the Mau Mau rebellion in the 1950s. The MauMau, it must be said, were vile. After swearing to magical oaths, they butchered children, they tortured, mutilated and murdered -mostly Africans- who would not join their movement. The Kenyan government now calls them heroes, and has a national day in October to honour them, which is a despicable re-writing of history. But the British response to the uprising was also brutal, driven by the atavistic fears of the settlers in the so-called White Highlands, commonly regarded as the most snobbish and racist in the Empire. 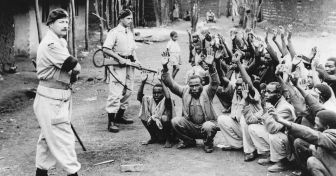 Tens of thousands of Kenyans were sent to detention camps where many were subjected to torture and extreme violence. Much of this seems to have been covered up. The Attorney General at the time minuted: “If we’re going to sin, we must sin quietly”. Even now, the Foreign Office is trying to stop the case, arguing it happened so long ago there isn’t the evidence, or surviving witnesses, for a fair trial. Unfortunately for them, truckloads of official documents from that era have recently been uncovered. Historians who’ve seen some of them say they detail systematic abuses that seem to have been known, and tacitly approved, at the highest level in London. In any case there’s something intellectually dishonest about making judgments about the distant past through the prism of our modern sensibilities. But this really is moral relativism of the worst kind. We can’t lecture others about human rights and try to escape responsibility for our abuse of them. It’s wrong to be so ashamed of our imperial past. But it would be worse to deny justice to its innocent victims. If hypocrisy is the issue let’s just stop the preaching. Mau Mau also committed brutal atrocities of a ferocious kind on thousands of fellow Kenyan Africans and were noted for their indiscriminate slaughter. That they should now appear as sanitized victims for future taxpayers to buy-off is really a sickening joke. Who will compensate the thousands of maimed A fricans the Mau Mau tortured? I am English, but am descended from people who were colonised by the English with terrible violence and oppression for six hundred years. I fail to see why I should be asked to pay taxes to compensate others for what was done in the name of a British government which is now long gone.